The Patagonia Ultralight Sticky Fishing Wading Boot for Men is a Patagonia fishing wading boot for men that features long-lasting Rock Grip sticky rubber soles that are very innovative and have the ability to hold fin straps and accepts studs and can also be resoled. This sticky fishing wading boot is constructed with quick drying synthetic leather that is very lightweight, durable and comfortable. This sticky fishing wading boot for men also features a durable Venergy mesh with Bionix yarns that features the ability to drain quickly and keeps the sand out when you’re fly-fishing at your favorite fly-fishing destinations. The Patagonia Ultralight Sticky Fishing Wading Boot for Men is designed with internal upper support and reinforced toe box that resists water pressure when men are deep wading. This sticky fishing wading boot for men is also the winner of the 2012 “Best Footwear” award at EFTTEX, the European Fishing Tackle Trade Exhibition which means that this fishing wading boot for men is a true winner. 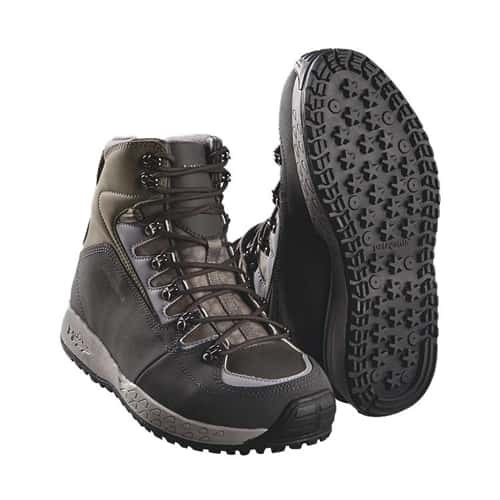 This Patagonia Ultralight Sticky Fishing Wading Boot for Men is also designed tough as the upper is designed with synthetic leather that utilizes a polypropylene insole board and the midsole is designed with full-length molded EVA. If you are in the market for a top quality made, perfectly crafted sticky sole fishing wading boot for men that is also lightweight, extremely durable and long-lasting, then make sure to check out this amazingly innovative Ultralight Sticking Fishing Wading Boot for men by Patagonia. on 12/7/2017 These Patagonia Ultralight Wading Sticky Boots are just what the doctor ordered! These Patagonia Ultralight Wading Sticky soled boots are incredible as they fit perfectly, look great, function unbelievably and are great all-around fly-fishing wading boots by Patagonia, so definitely check out these Patagonia Ultralight Wading Boots - Sticky to wear during your next fly-fishing getaway.